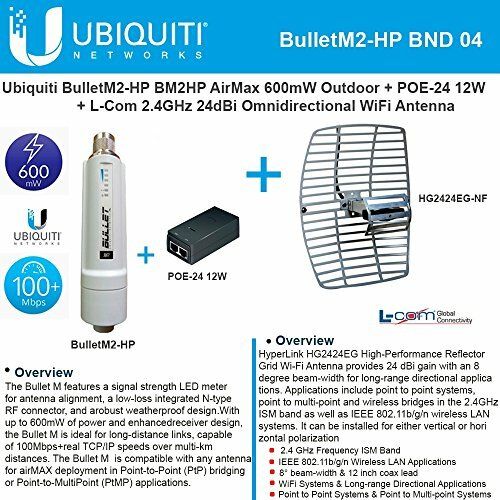 BulletM2-HP Ubiquiti Bullet M2HP Plug and Go 100Mbps+ of REAL TCP/IP Throughput over outdoor multi-km links 2.4GHz Hi Power 802.11N Outdoor Radio System POE-24 12W Ubiquiti POE-24 24VDC 12W is an advanced power supply / power inserter. The power supply is autoranging on the input and has a regulated voltage output. It has overload and short circuit protection in addition to Ethernet surge suppression builtin. The Ubiquiti POE-24 12W is not a proprietary unit. For all models the power is supplied on ethernet pins 4/5 (V+) and 7/8 (V-). For the models the power is supplied on ethernet pins 4/5 (V-) and 7/8 (V+). Ubiquiti POE-24 12W come complete with a standard North American 115VAC power cord. The power supply can be centrally located where it can be attached to an uninterruptible power supply. The user has the ability to easily power on reset the attached equipment from a remote location. HG2424EG-NF L-com HG2424EG-NF 2.4 GHz 24 dBi Lightweight Die-cast Grid Antenna - N-Female Connector The HyperGain® HG2424EG Lightweight series of aluminum die-cast directional parabolic GRID antennas are suitable for outdoor applications in the 2.4GHz ISM band. The "EG" GRIDs are of lighter weight construction and offer very good value in moderately challenging environments. For commercial and professional installations in most applications and in challenging environments, the heavier weight standard HyperGain® HG2424G High Performance GRID is recommended. This 24dB grid antenna's construction features a die cast aluminum reflector grid for good strength and ease of installation. This antenna's 2-piece reflector grid is simple to assemble and significantly reduces shipping costs. The grid surface is UV powder coated for durability and aesthetics. The open-frame grid design minimizes wind loading. Ubiquiti BulletM2-HP 600mW Indoor Outdoor airMAX Radio 2.4GHz 11b/g/n, integrated N-type male jack, robust weatherproof design, completely integrated radio. L-com HG2424EG-NF 2.4 GHz 24 dBi Die Cast Mini-Reflector Grid Antenna N-Female Connector, High-Performance Reflector Grid Wi-Fi Antenna provides 24 dBi gain with an 8 degree beam-width for long-range directional applications. Applications include point to point systems, point to multi-point and wireless bridges in the 2.4GHz ISM band as well as IEEE 802.11b/g/n wireless LAN systems. It can be installed for either vertical or horizontal polarization. Bullet M2 high power delivers up to 100+ Mbps real TCP/IP throughput, durability to last outdoors, the robust weatherproof case withstands harsh outdoor conditions. Ubiquiti airMAX technology is proven in millions of deployments worldwide, exhibiting outstanding performance in outdoor environments. The TDMA airMAX protocol enables unprecedented scalability, high throughput and low latency in unlicensed, multipoint networks.